Though it wasn’t a destination wedding for them, couple Elizabeth and Ryan wanted their Colorado wedding to feel like one for their guests. 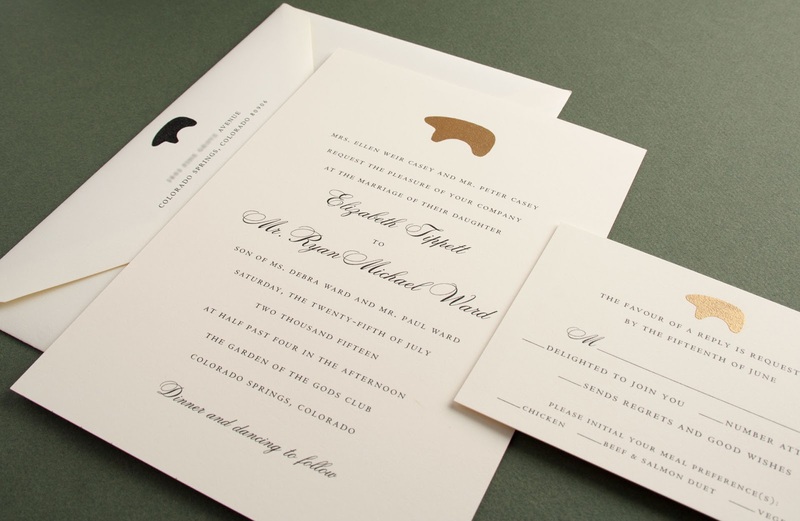 They also wanted to pay homage to their home state, and that is how a golden bear motif ended up perched atop their invitations. Elizabeth and her mother worked with Deb at CJ Kard in Colorado Springs to create their elegant invitations. Here, bride and stationer talk about “branding” a wedding and why, when it comes to wedding invitations at least, brides still favor good ole fashioned in-person shopping. Ryan and I met while working together at Restaurant.com. When he called to ask me on our first date, I thought he was calling about a work-related issue. I was so caught off guard that instead of saying yes, I panicked and said, “maybe.” He jokes that he had heard no before, but a maybe really threw him off! Of course, I called back and said yes. Our proposal was an incredible comedy of errors that culminated with a perfect moment at the top of a mountain. 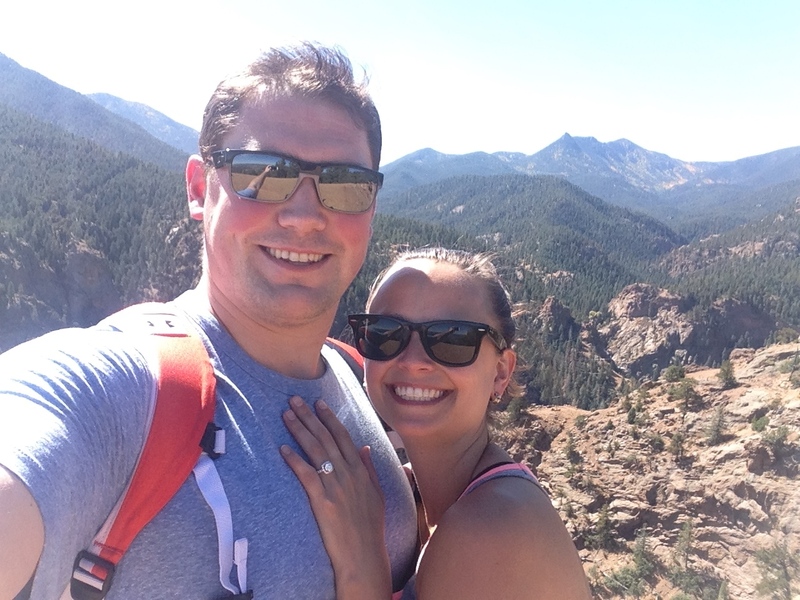 I grew up in Colorado and treasure every moment I get to spend there, so Ryan knew that was where he wanted to propose. He planned a weekend trip for us and had everything scheduled perfectly. But the morning of our flight, a fire at a radar tower outside Chicago effectively grounded all air traffic in the Midwest. There were thousands of passengers stranded that day but he was dead set on getting to Colorado. So, two canceled flights, about 10 phone calls with the airline and one rental car later, we ended up driving five hours to Louisville, Kentucky, and flying out on the red eye the next morning. We were exhausted and cranky when we finally arrived and I thought he was crazy when he insisted we go on a hike “to stay awake.” When we got to the overlook at the top of the mountain, he told me to turn around so he could get a picture of me with the view in the background. When I did, he was down on one knee. It definitely made the painful travel experience worthwhile! I had a pretty clear picture in mind of what I wanted the invitations to look like, but they evolved into something even better than my initial idea. I wanted to honor the Western spirit of our Colorado venue with something that was both elegant and personal. The simple Zuni bear symbol fit the bill perfectly: Ryan’s nickname is ‘Bear’ and the bear itself is a nod to Colorado and the brown bears that regularly amble through my mom’s front yard. I had initially wanted the invitations to be all black and white, but Deb—who was wonderful to work with—suggested ordering a second proof in gold. The metallic gave an added hint of elegance that I just love and really “made” the whole look. I picked out our particular invitation suite almost immediately after flipping through the book of options with Deb; it caught my eye right away. I liked that it was traditional, but the combination of block letters and script for the names gave it a hint of modern flair. Plus, I could picture exactly where our bear would fit into the look. I loved how just a few minor changes—changing text from blue to black and replacing the monogram on the sample with the bear—made it so uniquely ours. Do you have any advice for brides-to-be on the invitation ordering process? Carry the theme of your invitation through all of the pieces. I work in marketing and joke that we’ve applied branding principles to our wedding, but it really makes everything come together beautifully. We added the bear on the RSVP card, the accommodations card and on the back flap of the envelope by the return address, and it will make several more appearances at the reception in places like our table numbers, cocktail napkins and place cards. What moment were you most looking forward to on the big day? It’s hard to choose just one, but I’m really looking forward to the moment right at the end of the ceremony when we’ll turn around as a married couple and see our friends and family from across the country together in one place, happy and ready to celebrate. Tell me about your first meeting with Elizabeth and about the process you went through to get to the final decision. I met with Elizabeth and her mom, Ellen, during the week of Christmas. Elizabeth was home for the holiday and seemed genuinely excited to be wedding planning and spending quality time with her mom. (I believe she had actually just come from a hair and make-up trial run—she looked stunning!) During the process they kept remarking, “This is so much fun!” which really makes my job a treat. They are both such lovely people; I only wish I could have met Ryan, too! Elizabeth came in with a very clear idea of what she wanted regarding her invitations ensemble, which is actually surprisingly uncommon. She has very classic, elegant taste and wanted this displayed in her invitation with just a touch of Colorado flair. I really just helped turn her vision into reality! Aside from the basic event details (when, where, guest count, etc. ), I like to start by asking what sort of vision the bride and/or groom has for their big day. This may include a discussing a theme, color scheme or just showing me things that they have pinned on Pinterest. From there I can get a general sense of the bride’s personal style and start pulling samples that I think will match her vision for the day. The “rustic chic” trend came in with full force and really hasn’t died down much—especially here in Colorado. Because we live in such a beautiful state, a lot of our brides really treat their big day like a destination wedding for their friends and loved ones and want this conveyed in their invitation. I have seen this “theme” carried out in all degrees of formality. Many of our brides want a beautiful invitation that will get their guests excited about the event, but also want to create a more casual impression. I think Elizabeth and Ryan’s stationery was really the perfect example of a more formal, timeless take on an invitation for an elegant Colorado wedding. What advice do you have for brides ready to make their first invitation appointment? I think that “inspiration board” websites, like Pinterest, have been such a help to the modern bride. It can be overwhelming to plan a wedding, and I think that online communities like this make the process so much more accessible to the average bride. Doing a little bit of preliminary research to figure out what you like can make the process feel much less daunting. While, personally, I have only been working with brides for a couple of years, I would say that brides today are much different and, also, not that different! Much more information is accessible to today’s bride on the internet that was not available five years ago. This creates a larger percentage of brides that are already somewhat versed in paper, print methods, etc. The online community is also helping brides become more aware of their ability to create a unique or custom invitation that communicates their personal style. Your wedding invitations do not have to look like your mother’s wedding invitations from thirty years ago! That being said, I still find that many brides get overwhelmed and frustrated if they attempt to actually order their invitations online—it’s about as straightforward as trying to purchase your wedding gown online, sight unseen. Brides, in general, have not changed much in the sense that they still want the sensory experience of seeing an invitation in person, carefully selecting the perfect ink color or typestyle and feeling the paper. They also want knowledgeable guidance from a real person who can help them find the most appropriate way to word their invitation or answer their questions about etiquette. It is our goal at CJ Kard to continue to evolve along with today’s bride, while still offering her our timeless etiquette expertise and the highest quality stationery.